Tasty, healthy Vegan Power Bowl recipe, with an herby green tahini sauce! Today’s recipe is coming a day late because I had an unexpected trip to the ER on Tuesday night, and I didn’t get home until 5:00 AM on Wednesday. For a few days I was having these extreme cramps in my lower abdomen, and they migrated to the lower right side. I tried to push through, but when I had a low-grade fever and nausea on Tuesday night, I called my mom (who is a nurse) and she recommended that I go to the ER. The doctor said it sounded enough like appendicitis to run a full blood test and CT scan. But weirdly enough, everything came up negative – no inflamed appendix, no ovarian cysts. They said it was menstrual cramps, told me to follow up with my OBGYN, and sent me home with painkillers. I’m a little flustered because I’ve been lucky enough to only have mild cramps throughout my entire adult life, and I’ve never experienced this type of acute, localized pain in my abdomen. And I am NOT one to go to the ER… I’m a very “push through it” type of person. Oh well! I’ll have to see what my OBGYN says. But all in all, just a little bump in the road! Let’s talk food. For today’s recipe I went to my culinary strengths – that is to say, vegan bowls. 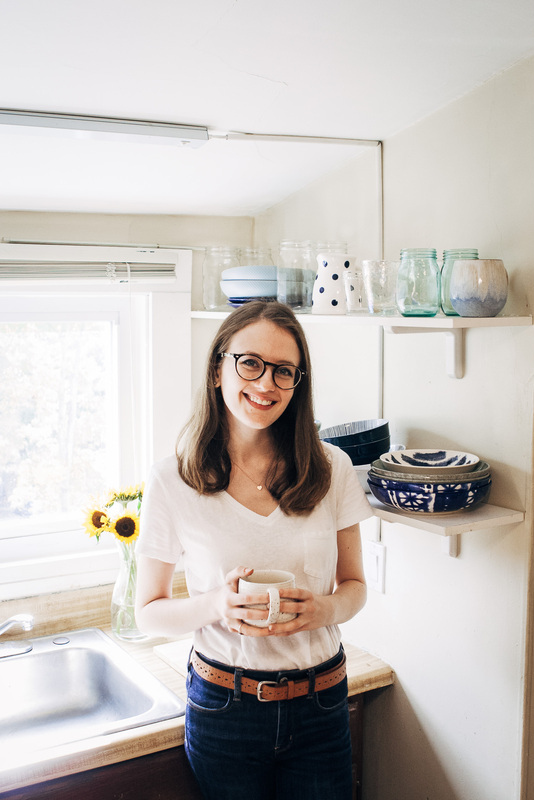 My vegan buddha bowl and winter buddha bowl are two of my most popular recipes, and I wanted to create something with a similar idea, that my readers love! 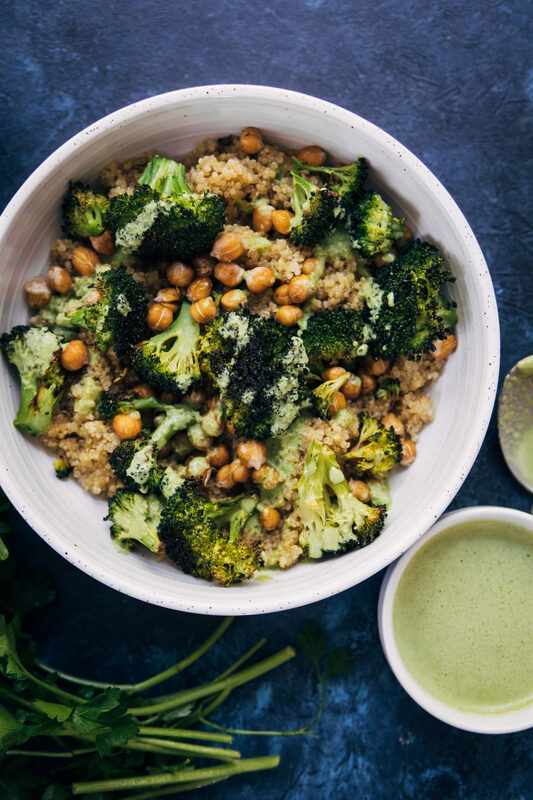 This vegan power bowl has a ton of flavor in every bite – with spiced chickpeas (a Well and Full classic), garlicky broccoli, lemon quinoa, and a pretty dang fantastic green tahini sauce. Out of all the components in this recipe, the tahini sauce is definitely my favorite. The recipe makes extra, so you could use this as a salad dressing (it’ll keep in the fridge up to a week), as a dip for fries, or even swirled into a creamy soup! The possibilities are endless!! 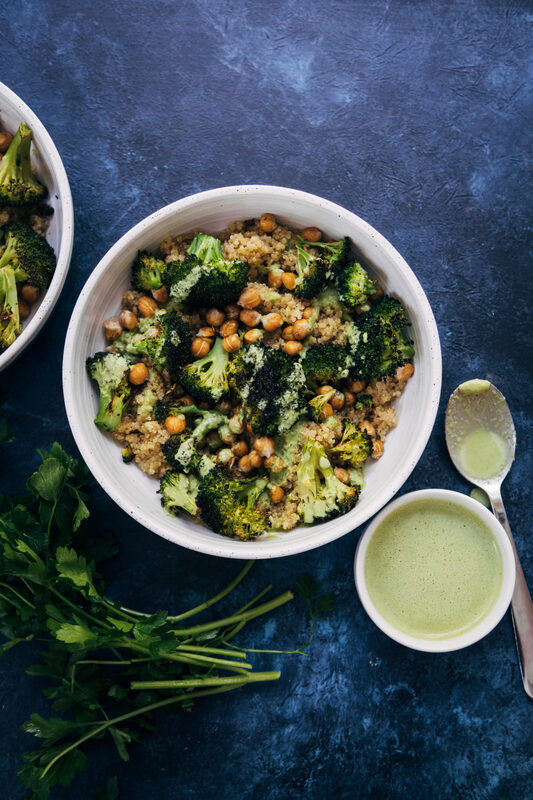 This delicious vegan power bowl is packed with plant-based protein and nutrients, to fuel your day! I've found that different brands of quinoa call for different amounts of water. Just use the amount it says on your box of quinoa! Rinse and dry your chickpeas. In a bowl, mix chickpeas, oil, salt, pepper, and paprika until they're all evenly coated. Assemble your bowls - add in the layer of quinoa first. 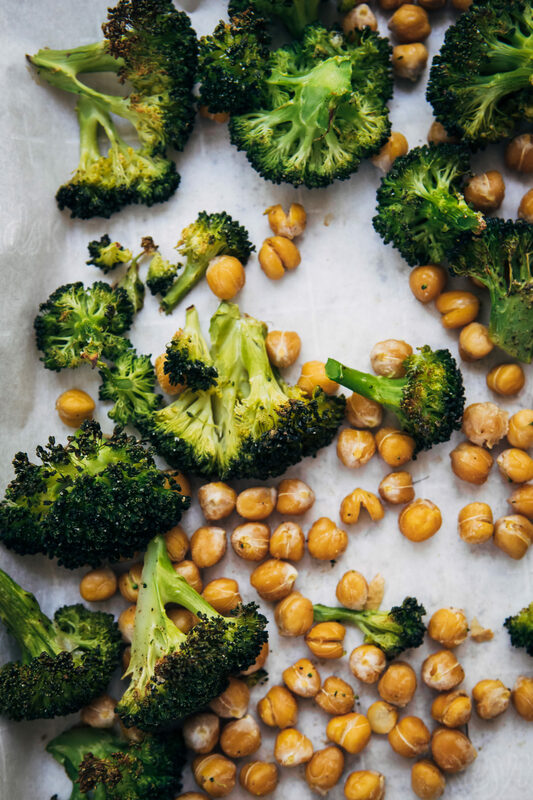 Top with broccoli and chickpeas, then drizzle with the tahini sauce. Add on hemp or sesame seeds (or both!) and any other toppings you like. The dressing calls for two limes, which can easily be halved if you don't like a tangy flavor. Add in the juice of the first lime, taste the dressing, then add more if desired. This is perfection in a bowl. Love your attention to detail and seasoning all of the parts to this dish. The spicy tahini sauce looks like liquid green gold!!!! I’ve been looking for easy, vegan Buddha / Power Bowl recipes to make and this is a perfect one! Recently just finding your blog, very glad I have! 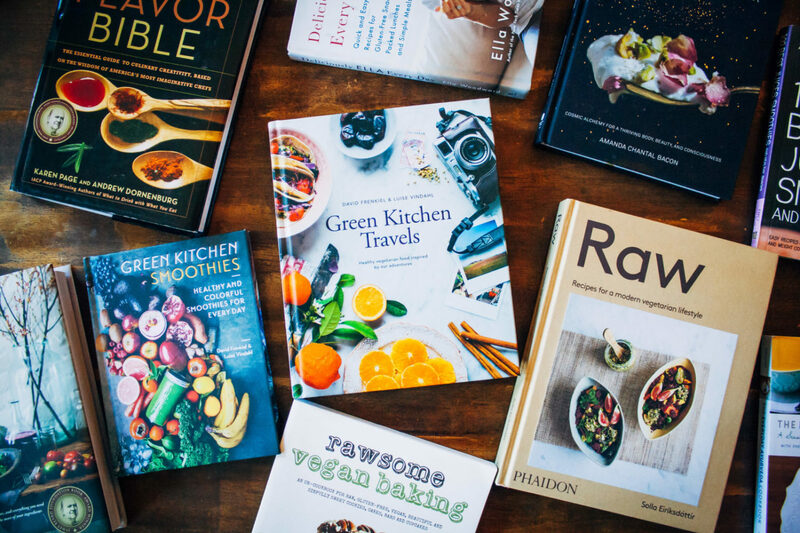 Thank you so much for these awesome recipes ( I’ve been stalking all the vegan ones ), excited to try them out! I’m actually more concerned about YOUR health, and the pain you encountered? I hope you are better? and painkillers – that always sends out a warning message to me! After all they are the experts and have the Equipment. Could it have been a pulled muscle??? I DID that one time, in my lower groan area. I could barely walk…was crawling on the floor. Turns out, I had pulled a bag of dirt out of my car earlier that day…and several hours later – Pain like you wouldn’t believe. Except it was on the left side. So… hope you are better… keep us posted! GROIN – not groan…but you can add a lot of Groaning to the Mix! Haha I guessed what you meant ;) I’m definitely feeling better, it was really nice of you to ask :) I don’t think it was a pulled muscle though, the pain was more *in* my stomach, and not in my abdominal muscles. I’ll definitely post an update when I have more information!! Just made this! Thank you for the great recipe it’s delicious and super easy will definitely be making this again . Sorry to hear about your trip to the ER- hope you feel all better and get that figured out! Meanwhile, this bowl is absolutely stunning. It’s basically all of the foods my body has been craving lately, so I can’t wait to try it out! Thanks for the awesome recipe!! As for your pain, my gut instinct says acute diverticulitis and underlying diverticulosis. Best of luck!! Thanks so much for your kind words :) I still haven’t been able to figure out what caused it but hopefully I’ll be able to figure it out soon! Thank you so much Maya <3 I'm really hoping this is the end of the cramps, but only time will tell. I’m sorry to hear about your ER stint and hope all is well with you. Forgive me, but I tried this recipe and sadly did not like it one little bit. I’m only commenting in case this happens to be the first recipe a person embarking on a vegan or vegetarian pathway tries – I’d hate to think that they may think this represents all vegan food and they head straight back to eating animals. Anyhow, the quinoa was nice but not very lemony at all. I’m also not sure how this recipe is for 2 people because the 1 and a 1/2 cups of quinoa alone cooked up enough for 4-6 people (maybe we are small eaters). The garlicky broccoli was nice and so were the chickpeas but I think it all went south when combined with the green tahini sauce – everything together just tasted very weird and bitter. Kudos to my 18 year old son for giving it a good try and incredibly grateful that I had left over lentil soup on hand to feed my 13 year old son. I’m not picky with food normally but wow, this made me gag. My poor 18 year old also said he was doing his best not to gag. I was going to have the leftovers for lunch at work tomorrow but I dread waking up tomorrow knowing what awaits me in the fridge for lunch, so I’m just going to have to bin it. The rest of the mountain of quinoa I will make something else with, so not all is lost. Hats off to everyone who liked this recipe and thanks Sarah for your time in sharing the recipe, even though my family and I did not like it. Thanks for your reply Sarah – it is quite possible it was the tahini. The sauce tasted ok on it’s own, but just didn’t work when combined with everything else. Not to worry. You have a nice looking blog – I’ll have a look around at some of your other recipes. Look at my note about adding a bit of balsamic to it. It was yummy that way. That’s a great tip!! I’ll have to try out this recipe with balsamic, I know I’d love that extra tang :) Thanks so much for leaving this note! This recipe is so delicious and I love that it’s made from pantry and fridge staples. My sauce didn’t turn out very green so I was nervous that I did it wrong but all of the flavors complimented one another very well! I was nervous about trying this recipe after reading the negative comment, but I love tahini so I wanted to try it. Everything turned out delicious, especially the broccoli. My family loved it! Hi ! I made this tonight and it was amazing ! The roasted chickpeas and broccoli were perfection! My 10 yr old son wanted the broccoli “ for dessert too”. Only thing is my sauce wasn’t green , but still tasted great! Every time I try out your recipes I always end up satisfied with a belly that feels all warm and fuzzy inside. Thank you for everything you do. My life would surely not be the same had I not found your website. I have made this a couple of times….in fact, I made it today! I have found that the tahini gets a bit bitter sometimes so I reduce it a bit and add in balsamic vinegar. It adds just the right touch of sweet. Yummy. Does anyone have any ideas for a broccoli substitute? My husband is allergic to broccoli. Thank you for your reply. I will try it with cauliflower. Fortunately, he’s allergic to only broccoli and eggplant. I think your recipe card was broken because I couldn’t see serving size. But I made it anyway and there was a perfect amount of quinoa for two bowls. I also loved the flavor of the jalapeño sauce, it was spicy but still really flavorful. Will definitely make this again!! Hi Alexis, I’m so sorry about that, I have been having issues with my recipe plugin and hopefully it will be resolved soon! But I’m so glad to hear you liked the recipe, thank you for leaving a review! !